EusLisp adopts Brep (Boundary Representation) as the internal representation of 3D geometric models. Components in Breps are represented by classes edge, plane, polygon, face, hole, and body. Primitive body creating functions and body composition functions create new instances of these classes. In order to use your private geometric classes having more attributes, set special variables *edge-class*, *face-class* and *body-class* to your class objects. returns a newly created float-vector that is the sum of all the elements of vector-list. The difference from v+ is that vplus computes the sum of more than two arguments and no result vector can be specified. returns the mean vector of vector-list. a, b, c are float-vectors representing 2 or 3 dimensional points. normal is the normal vector of the plane on which a,b, and c lie. Triangle returns 2*area of a triangle formed by a,b,c. Triangle is positive if a,b, and c turn clockwise when you are looking in the same direction as normal. In other words, if triangle is positive, c locates at the left hand side of line a-b, and b lies at the right side of ac. finds a normal vector which is vertical to the triangle defined by three points a,b,and c.
Computes an angle between two vectors, denoted by . v1,v2 and normal must be normalized vectors. When normal is not given, a normalized vector commonly perpendicular to v1 and v2 is used, in which case the result is always a positive angle in the range between 0 and . In order to obtain a signed angle, normal must be specified explicitly. Computes surface normal vector from a list of float-vectors which lie on the same plane. finds the farthest point from p in the list of 3D float-vectors, points. finds the farthest point pair in the list of 3D float-vectors, points. Finds the index of the absolute maximum value of three elements. Generates a random vector which is distributed homogeneously in 3D Cartesian space. returns a normalized-3D random vector. returns a list of random vectors. p1, p2, p3 and p4 are all float-vectors of more than two dimensions. p1-p2 and p3-p4 define two lines on a plane. line-intersection returns a list of two parameters of the intersection point for these two lines. When used in three dimension, p1, p2, p3 and p4 must be coplanar. p1, p2, p3 are all three-dimensional float-vectors representing three point locations. Collinear-p returns the parameter for p2 on the line p1-p3 if is smaller than *coplanar-threshold*, otherwise NIL. p1, p2, p3 are all three-dimensional float-vectors representing a plane. Find-coplanar-vertices looks for coplanar points in vlist that lie on the plane. finds an edge in edgelist that connects to vertex. bodfacs is a body or a list of faces. make-vertex-edge-htab makes a hash-table which allows retrieving of edges connected to a vertex. Assume points, p1, and p2 lie on the plane whose normal vector is normal. Left-points searches in points and collects ones lying in the left hand side of the line passing on p1, p2. Assume points, p1, and p2 lie on the plane whose normal vector is normal. Right-points searches in points and collects ones lying in the right hand side of the line determined by p1, p2. Assume points, p1, and p2 lie on a plane whose normal vector is normal. left-points searches in points which lie in the left-hand side of the line determined by p1, p2 and returns the farthest one. Assume points, p1, and p2 lie on a plane whose normal vector is normal. right-most-point searches in points which lie in the right-hand side of the line determined by p1, p2 and returns the farthest one. compares two float numbers num1 and num2 for equality with the tolerance of *epsilon*. returns T if is apparently less than , i.e. .
returns T if is possibly less than or equal to , i.e. .
returns T if is apparently greater than , i.e. .
returns T if is possibly greater than or equal to , i.e. .
defines a minimal rectangular-parallel-piped which is bounded by the planes parallel to xy-, yz- and zx-planes. 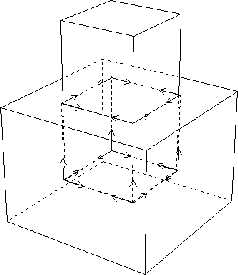 Bounding-box can be used in any dimension according to the dimension of vectors given at the initialization. 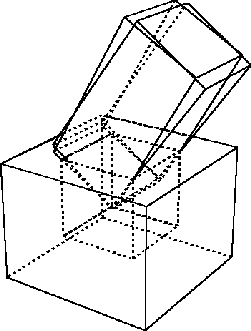 Bounding-box had been defined by the name of surrounding-box. returns this bounding-box object itself. returns the volume of this bounding box. increases or decreases the size of this box by the rate. When rate is 0.01, the box is enlarged by 1%. returns T if point lies in this box, otherwise nil. returns the intersectional bounding box of this box and box2. If tolerance is given, the box is enlarged by it. If there is no intersection, NIL is returned. returns the union of bounding box of this box and box2. returns T if this box has the intersection with the box2, NIL otherwise. This method is faster than :intersection because no new instance of bounding-box is created. returns one of the eight corner points yielding the largest dot-product with direction. returns the list of all vertices of this box. 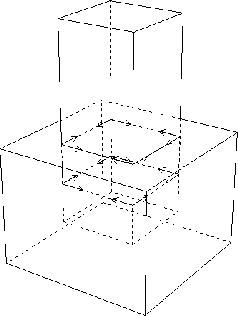 If this box defines 2D bounding-box, then 4 points are returned, 3D, 8, and so on. returns T if this box is below box2 in direction. This is used to check whether two box intersects when this box is moved toward direction. returns a body object that represents a cube bounded by this box. sets minpoint and maxpoint slots looking in vlist. If tolerance (float) is specified, the box is grown by the amount. finds the minimum and maximum coordinates in the list of points, and make an instance of bounding-box. makes an instance of the surrounding-box representing the union of boxes. The resulted box is expanded by the tolerance. makes an instance of the surrounding-box representing the intersection of boxes. The resulted box is expanded by the tolerance. The direction of the vertex loop or the edge loop is defined so that the vertices or edges are arranged in the counter-clockwise order when the body is observed from outside. Pvertex and nvertex, and pface and nface are determined so that an edge is oriented from pvertex toward nvertex when pface is located at the left of the edge observing them from outside. defines a line passing on pvert and nvert. The line is directed from pvert to nvert in the parametric representation: . returns the list of pvert and nvert. returns a three dimensional float-vector that corresponds to the p parameter on this line. Computes the parameter for point on this line. This is the inverse method of :point. returns a normalized vector from pvert to nvert. returns the other end-point of this line, i.e. if v is eq to pvert, nvert is returned, if v is eq to nvert, pvert is returned, otherwise NIL. creates and returns a bounding-box of this line. checks intersection between box and the bounding-box of this line. returns the length of this line. returns the distance between the point-or-line and this line. If the foot of the vertical line from the point to this line does not lie between pvertex and nvertex, the distance to the closest end-point is returned. Using this method to calculate the distance between two lines, interference between two cylinders can be tested. finds the parameter for the point which is the foot of the vertical line from point to this line. finds the line which is vertical both to this line and to l and returns a list of two 3D float-vectors. returns a list of two points that are the projection of pvert of nvert onto plane. When two lines are in parallel and a common perpendicular line cannot be determined uniquely, parallel is returned. checks whether point is collinear to this line with the tolerance of tolerance using collinear-p. If point is collinear to this line, the parameter for the point on the line is returned, otherwise NIL. checks whether the point is collinear to this line, and the point lies on the part of the line between pvert and nvert. checks if ln is collinear to this line, i.e. if the two end-points of ln lie on this line. T or NIL is returned. checks if this line and ln are coplanar. Two end-points of this line and one end-point of ln defines a plane. If another end-point of ln is on the plane, T is returned, otherwise NIL. ln is a line coplanar with this line. :Intersection returns a list of two parameters for the intersection point of these two lines. A parameter may be any float number, but a parameter between 0 and 1 means an actual intersection on the line segmented by two end-points. NIL if they are in parallel. ln is a line coplanar with this line. Two parameters of the intersecting point is returned along with symbolic information such as :parallel, :collinear, and :intersect. represents an edge defined as the intersection between two faces. Though pface and nface are statically defined in the slots, their interpretations are relative to the direction of this edge. For example, pface represents the correct pface when this edge is considered to goes from pvert toward nvert. So, pvert and nvert in your interpretation must be given to the :pface and :nface methods to select the appropriate face. creates an instance of line whose pvert is point1 and nvert is point2. returns pvertex when face is regarded as the pface of this edge. returns nvertex regarding face as the pface of this edge. returns the body object that defines this edge. returns pface when the pv and nv are interpreted as the virtual pface and nface of this edge, respectively. returns nface when the pv and nv are interpreted as the virtual pface and nface of this edge, respectively. finds the direction vector which is perpendicular both to this line and to the normal of aface. returns the angle between two faces connected with this edge. computes the angle between two faces connected with this edge and stores it in the angle slot. sets the f face as a pface regarding pv as the pvertex and nv as the nvertex. Note that this may change either pface or nface of this edge. T if this is a contour edge, i.e., either pface or nface of this edge is visible and the other is invisible from viewpoint. T if this edge is an approximated edge representing curved surface like the side of a cylinder. Approximated edges are needed to represent curves by segmented straight lines. In EusLisp, every curved surface is approximated with many planar faces. The LSB of flags is used to indicate that the faces on the both sides of this edge are curved faces. :set-approximated-flag sets this flag to T, if the angle between two faces is greater than threshold. A plane object is represented by the normal vector on the plane and the distance from the coordinates origin to the plane. Two pairs of such normal vectors and distances are recorded in a plane object. One represents the current status after transformations, while the other represents the original normal and distance when the plane is defined. defines plane-equation. A plane is considered to have no boundaries and extend infinitely. returns this polygon's normal vector which is always normalized. computes distance between this plane and point. returns T if point lies on this plane. returns T if line lies on this plane. computes the intersection point between this plane and the line determined by two end points, point1 and point2, and returns the parameter for the intersection on the line. If the line and this plane are parallel, :parallel is returned. Returns the parameter of the intersection point for this plane and a line represented by point1 and point2, or edge. Returns a 3D vector which is the orthogonally projection of point onto this plane. Defines a plane with the point on the plane and the normal vector. Normalmust be a normalized vector, . Polygon represents a loop on a plane. Convexp is a boolean flag representing the convexity of the loop. Edges is a list of edges forming the contour of this loop, and vertices is a list of vertices. returns a bounding-box for this polygon. makes a bounding-box for this polygon, and returns the intersection of the bounding-box and box2. If there is no intersection, NIL is returned. returns the list of edges (circuit) of this polygon. The list is ordered clockwise when the polygon is viewed along the normal vector of this plane. If you think of the normal vector as a screw, the edges are ordered in the rotation direction for the screw to screw in. When polygon or face is used for the surface representation of a solid object, the normal vector is directed to its outside region. 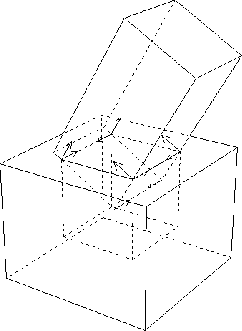 When a polygon is viewed from the outside of the object, edges are ordered counter-clockwise. returns the n-th element of edges. returns the vertices of this polygon ordered in the same manner as edges. Note that the first vertex is copied duplicatedly at the end of the list and the list is always longer by one than the actual number of vertices. This is for the ease of edge traversal by using the vertices list. returns the n-th element of vertices. returns :inside, :outside or :border according to the location of point relative to this region. Computes the intersection with the semi-line defined by the point and the normalized direction vector, vnorm. Computes intersection point with a line specified by p1 and p2. The result is nil(no intersection) or list of the parameter and the intersection position. Computes intersection point with a line specified by the edge. The result is nil(no intersection) or list of the parameter and intersection position. Returns T if this region intersects with aregion. recomputes the surface normal vector of this polygon from the current vertices list. returns the area of this polygon. defines a face which may have holes. Pbody and type represent the primitive body and the type (:top, :bottom, :side) of the face in the body. Returns all the edges or vertices of the contour of this face and all the inner loops (holes). Note that :edges and :vertices methods only return edges and vertices composing the contour. decides whether the point is inside of this face or not. If the point is inside the outer contour of this face but also inside the loop of any holes, it is classified as outside. returns the area of this face, that is the area surrounded by external edges subtracted by the areas of holes. returns a list of the floating-point number and the float-vector representing the center-of-gravity of this face. If point is not given, the first number represents the area of this polygon, and the second float-vector the location of center-of-gravity of this polygon. If point is given, it is taken as the top vertex of the cone whose bottom face is formed by this polygon, and the volume of this cone and its center-of-gravity are returned. flips the direction of this face. The normal vector is inverted, and the order of edge loop is reversed. adds a hole in this face. returns the primitive-body which has defined this face. returns one of (:bottom), (:top) and (:side seq-no.). returns a list of the type of primitive-body and the face type. For example, a side face of a cylinder returns ((:cylinder radius height segments) :side id). returns primitive body which has defined this face. hole is a polygon representing an inner loop of a face. A face may have a list of holes in its holes slot. returns a face that contains this hole. makes a link to a face which surrounds this hole. This method is only used in conjunction with the :enter-hole method of the face class. defines a three dimensional shape. changes the size of this body by rate. Magnification is recorded in csg list. translates model-vertices. Vector should be given in the local coordinates. Translation is recorded in csg list. rotates model-vertices angle radian around axis. Rotation is recorded in csg list. changes coordinates. If pos is not given, rot is given as a instance of coordinate class. returns the list of all vertices of this body. returns the list of all edges of this body. returns the list of all the faces composing this body. returns the bounding-box of this body. calculates Euler number of this body, that is . This should equal to . returns the sum of length of all the edges. returns the volume of this body. returns the location of center-of-gravity assuming that this body is homogeneously solid. Returns common minimal box for this body and another body. 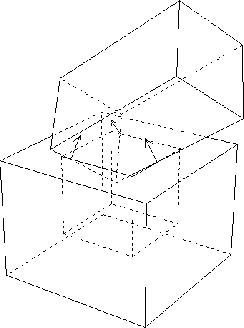 If there is interference between two bodies, the intersection must exist in this common-box. returns :inside if point resides in this body, :border if point lies on a surface of this body, and :outside otherwise. returns T if there is an interference between the faces of this body and face. Checks intersection with another body. reverse the directions of all the faces and edges so that the inside of this body becomes outside. collects all faces that intersect with a vector casted from point towards em direction. target may either be a float-vector or a plane object. :distance finds the closest face from target and returns a list of the face and the distance. returns csg body construction history. returns a list of primitive bodies which have constructed this body. T if this body is a primitive body created by one of functions listed in 16.5.
returns a Lisp expression to create this body. returns a list of creation parameters if this body is a primitive body, or an expression indicating this body is a complex (composed) body. returns a list of two elements. The first is a list of primitive bodies that is added (body+) to compose this body. The latter is a list of subtracted primitive-bodies. body is an instance of body that has composed this body, one of primitive-body types such as :cube, :cylinder, :prism, :cone, :solid-of-revolution, etc., or nil. If neither face nor id is given, all the faces that matches body is returned. If face is given, further filtering is performed. face must be one of :top, :bottom and :side. (send abody :get-face :cylinder :top) returns all the top faces of cylinders that compose abody. If face is :side, you can pick up faces that are numbered as id. (send abody nil :side 2) returns all the third (id begins from zero) side faces for any primitive-type bodies. initializes this body from :faces. :face is a required argument. Since face, edge and vertex must maintain consistent relation to define a complete solid model, it is meaningless to call this method with inconsistent arguments. In order to create bodies, use the primitive body creating functions described in section 16.5 and the body composition functions in section 16.6. Makes a plane object which is oriented to normal, and passes point. Instead of giving point, distance can be specified. makes a cuboid whose sizes in x, y and z directions are xsize, ysize and zsize. The coordinates origin of this cuboid locates at the center of the body. Makes a prism by lifting the shape defined by bottom-points along sweep-vector. If the sweep-vector is a number, not a float-vector, it is taken as the height of the prism in the direction. Bottom points must be ordered as they define the bottom face of the body. For example, (make-prism '(#f(1 1 0) #f(1 -1 0) #f(-1 -1 0) #f(-1 1 0)) 2.0) makes a cube of height 2.0. Makes a cylinder with specified radius and height. The bottom face is defined on xy-plane and the coordinates origin is located at the center of the bottom face. makes a cone body whose summit is the top and bottom face is the bottom. Top is a 3D float-vector. Bottom is either a list of vertices of the bottom face or a radius (scalar). If it is the vertices list, it is order sensitive. (make-cone #f(0 0 10) (list #f(10 0 0) #f(0 10 0) #f(-10 0 0) #f(0 -10 0))) makes a cone of a square bottom. Points are revolted along z-axis in the clock wise direction. If two end points in the points list do not lie on z axis, those points make circular faces. Thus, (make-solid-of-revolution '(#f(0 0 1) #f(1 0 0))) makes a cone, and (make-solid-of-revolution '(#f(1 0 1) #f(1 0 0))) makes a cylinder. The points are order-sensitive, and are expected to be arranged from higher coordinate to lower . makes a torus, a donuts like object. Points is a list of vertices on a cross-section. Makes a regular body of twenty faces. Each face is a regular triangle. Makes a regular body of twelve faces. Each face is a regular pentagon. By subdividing triangle faces of abody into four subfacets, makes a geodesic dome as a new body. 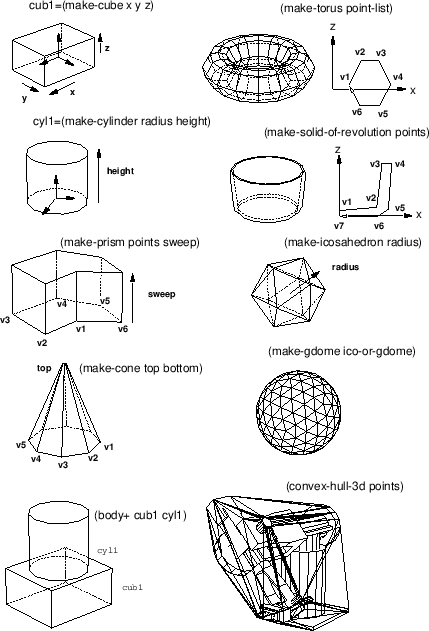 Abody should be an icosahedron initially, and then the result of make-gdome can be given to make-gdome recursively. At each call, the number of faces of the Gdome increases by the factor of four, i.e. 20, 80, 320, 1280, 5120, etc. Computes convex-hull for 2D points by Graham's algorithm. Slower than quickhull. Computes convex-hull for 2D points by the binary search method. Computes convex-hull for 3D points by gift-wrapping method. creates a body from lists of vertices each of which define a loop of a face in the consistent order. 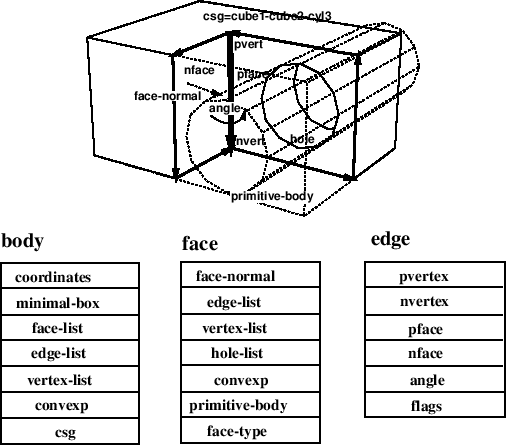 face1 and face2 are coplanar faces in 3D space. face+ composes union of these faces and returns a face object. If there is no intersection, original two faces are returned. face* returns intersection of these faces. If there is no intersection, NIL is returned. Cuts a body by the cutting-plane and returns a list of faces made at the cross-section. Computes join, difference or intersection of two or more bodies. Each body is copied before each body+, body- and body* operation, and original bodies are unchanged. The new coordinates of the resulted body is located and oriented at the same location and orientation as the world coordinates. Even when two bodies are touching face by face, these functions are expected to work correctly if threshold parameters *coplanar-threshold*, *contact-threshold*, and *parallel-threshold* are properly set. However, if a vertex of a body is in contact with an edge or a face of the other body, any composition operation fails. Cut the body by a plane which is an instance of class plane (made by make-plane). A newly created body is returned. Checks interference between each one-to-one combination in bodies. Returns a list of two bodies that are intersecting. Class coordinates-axes defines 3D coordinates-axes drawable on a screen. Each axis and an arrow at the tip of z-axis are defined by line objects. Since the coordinates-axes class inherits cascaded-coords, a coordinates-axes object can be attached to another cascaded-coords originated object such as a body. This object is used to see the coordinates-axes of a body or a relative coordinates to another coordinates. The method and functions described in this subsection require contact/model2const.l, contact/inequalities.l, contact/drawconst.l. returns self's constraint when self is in contact with b.
returns the possible motions which satisfy the constraint c.
returns the force which is applicable from the constrained body to the constraining body. draws the possible motions of a in contact with b. Type the return key for drawing. The following figures shows examples of constraints. The small arrows in the figures designate the constraints for the pegs. Figure 11: Constraints for a peg in a hole. The following figures shows an example of the possible motions of a peg in a hole. The example corresponds to the above program. PURPOSE: Computation of the voronoi diagram of a set of polygons. Please read the above quoted reference to understand the vocabulary and method used. No explanations about the program itself will be given here. INPUT: A list of polygons coordinates plus an enclosing frame. Enclosing frame can occur anywhere in data, and should be clockwise enumerated for outside-inside marking consistency (see below). Polygons must be simple, non intersecting. Aligned or flat edges are not accepted. Neither are isolated points or segments. A is a symbol whose property list contains the field "pos". This field itself contains a cons , (real) planar coordinates of the vertex. and field give counterclockwise predecessor and successor according to the dcel formalism (see Shamos and Preparata, Computational Geometry: An introduction, 1985, pp 15-17). A is also a symbol, whose property list also contains relevant information. Sites describe original input data; they can be of type :point (a polygon vertex) or segment (a polygon edge). is the gender of the bisector, determined by the type of the sites it separates. By convention, outside is the right side of a start-end edge. The voronoi diagram computes ouside as well as inside bisectors. Sort on outflag to keep the ones you want. Compute the Voronoi diagram of polygons from the with the above format. testdata.l Demonstration data, with the above format. 1- If you do not use EUS, edit the utilities.l file and modify the "compatibility package" according to the instructions. 3- (pv demoworld) run the program on demonstration data. The global variable *diagram* contains the bisectors of the voronoi diagram.